I spend too much time on the internet (I am a blogger after all), I'm addicted to Facebook, Twitter, Instagram, you name it, I'm on it. So, as you can imagine I also love Pinterest, I spend absolutely ages on there looking at pictures of other peoples food. 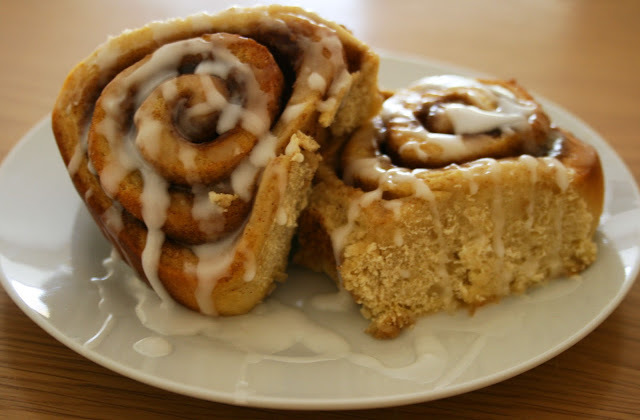 One thing that comes up all the time is cinnamon rolls, god knows how many times I've 'pinned' them, looked at the recipe and decided I am too lazy to make them. But this weekend my uni friend Laura came to stay, and after a long list of things I suggested doing, I suddenly realised we could bake. After a not so long internet research trip we decided on cinnamon rolls. I wish I hadn't waited so long to make them! They're so easy, taste delicious and make your house smell like actual heaven (really, if I die and heaven doesn't smell like freshly baked cinnamon rolls, God has some explaining to do). I have absolutely no idea about anything to do with 'bread' baking (it always goes wrong) so I used this recipe and have since fallen in love with her blog, it's full of amazing recipes. So I've popped the recipe on here in metric measurements for all of us in the UK to enjoy and made a few little changes to the method! So... Enjoy! Start by tipping the dry yeast in to the warm milk in a large bowl, add a tea spoon of the golden caster sugar and leave for around 10 minutes until it's all bubbly. Then pop the rest of the caster sugar, butter, salt and eggs and mix together with the yeasty milk with and electric mixer until well combined. Add the flour and fold it, mixing until it forms a dough. Tip the dough out on to a floured surface and knead for 5 minutes, until you have a lovely smooth dough. Pop the dough back in to the bowl, cover it with a tea towel and leave it in a warm place to rise for at least an hour (it should double in size). Pre heat the oven to 200 degrees then tip to dough on to a floured surface and roll out in to one large rectangle! (21 inches by 16 inches). Once it's rolled out brush the butter all over it, then mix the cinnamon and sugar together and sprinkle it all over! Then pop them in to the oven for 15-20 minutes. While they're baking, make up the icing by mixing the icing sugar with water and adding the vanilla extract.